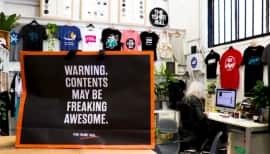 With two stores in tourist hotspots on Queensland’s popular Gold Coast, Xpress Tees is cashing in on the booming customisation revolution by taking a retail-kiosk approach to delivering personalised and on-demand tees to the masses. From humble beginnings selling designs at the local markets to a t-shirt printing powerhouse, The Tshirt Mill continues to go from strength to strength as it capitalises on the custom print revolution. And with a finger on the pulse of the music and festival scene, The Tshirt Mill is taking custom tees to the masses.